Exciting news! The Clarins Big Beauty Gift has arrived in Sam McCauley’s! Simply purchase 2 or more products from Clarins, one to be a moisturiser or serum, and you will receive 3 deluxe-size treats from Clarins absolutely free! 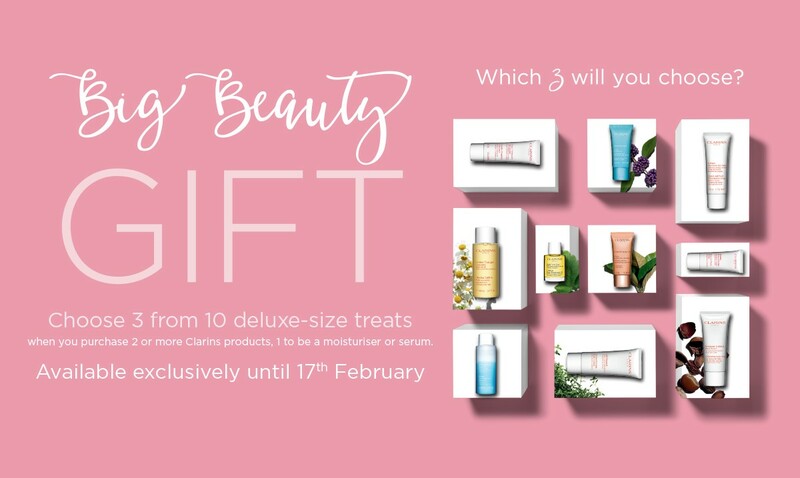 This offer is running until 17th February, so it’s the perfect time to start dropping hints that you would like a Clarins treat for Valentine’s Day! The selection of products is subject to availability and we expect this to be really popular, so don’t delaying in heading into your local store. This is exclusive to Sam McCauley stores and not available online. Find your local store here. A number of stores are also holding complimentary Clarins events this month. We have one in Dungarvan and another happening in North Main Street in Wexford. We will be announcing more, so make sure that you keep an eye on our Facebook page to be the first to know! Which 3 products would you choose from the Clarins Big Beauty Gift? Let us know is the comments below!